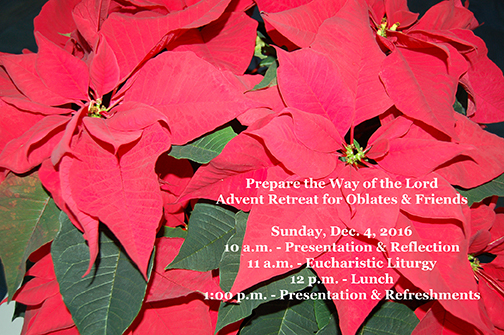 Advent Retreat for Oblates and Friends - Dec. 4 - 10 a.m. to 3 p.m.
All are welcome to attend our Advent Retreat for Oblates and Friends! Sister Susan Lardy will present "Prepare the Way of the Lord" to help prepare our hearts for the beautiful and holy season of Advent! This past year, as we have celebrated the Year of Mercy, we have been called to recognize the many ways we are preparing for the coming of the way of the Lord. Advent calls us deeper into this mystery with the scripture readings that lead us through the season of preparation--pointing our path to holiness in the daily activities of our lives. Let us come apart from our other holiday preparations to see how this past Year of Mercy continues to connect us with how we live mercy. Let us prepare our own hearts for the coming of the Lord.